Kilogram for kilogram of working load, BB and RT Orbit Blocks™ are the world’s lightest. To gain peak performance, we engineered out the heavy steel load straps, head post, shackle, full-length fasteners, and cleating accessories. Through extensive research and development, we replaced virtually all metal components with high-tech polymers and fibre equivalents. The unique orbital design allows the bearing to only be in the active areas of the floating sheave. This minimises the mass of the inactive return race and hub. Weight and bulk are further reduced in the different block configurations. The ball bearing single with becket and double with becket blocks have a through-sheave becket arrangement. The result? The lowest weight possible. Double blocks also have only a single intermediate cheek and an ultra-light and efficient head arrangement. This gives a 30% weight saving advantage over the nearest competitor. Other brands just link together their single blocks. This results in unnecessary double cheeks between each sheave, held together by a heavy steel channel across the top of the block. The floating sheave and bearing system is supported by a fibre-reinforced load frame. The design was computer modelled and optimised using stress analysis. The Dyneema® Link is produced from FSE Robline SK75 fibre, which is 10 times stronger and lighter than steel, and provides the final connection from the block to the load point. 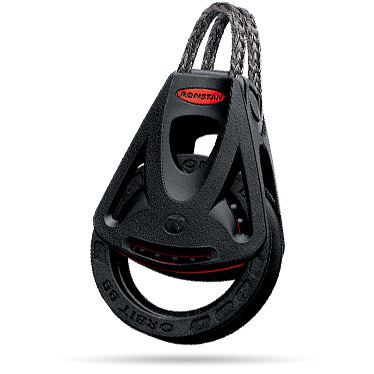 The Dyneema® Link is easily fitted and is retained securely by a moulded retainer clip. The flexible link can be left with one end attached to the block when fitting - no more lost shackle pins. The RF2457 stand-up kit features a clatter-free rubber boot. You can attach the Dyneema® link so that the block is aligned with the stand-up base or across it. It’s a neat, low-profile solution which allows full articulation.